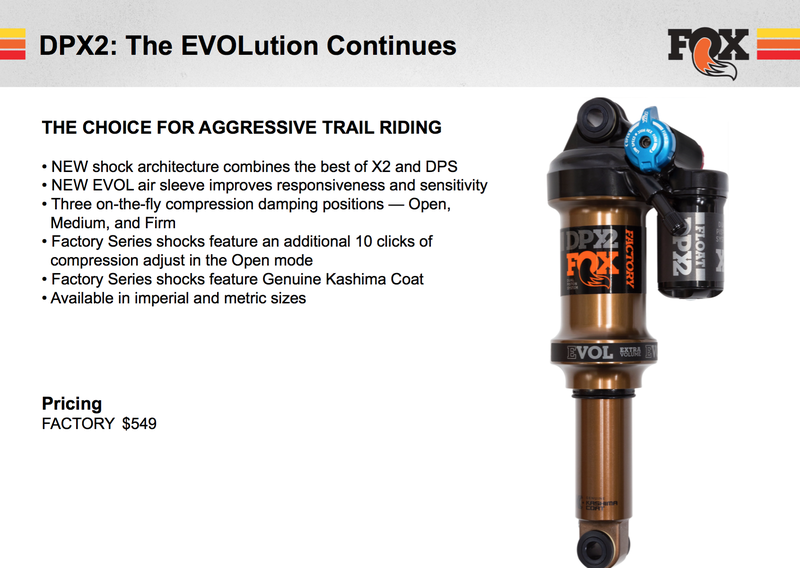 Today Fox released the new Float DPX2 rear shock, which is situated as Fox’s top-of-the-line option for “aggressive trail” riding. So what does that mean? 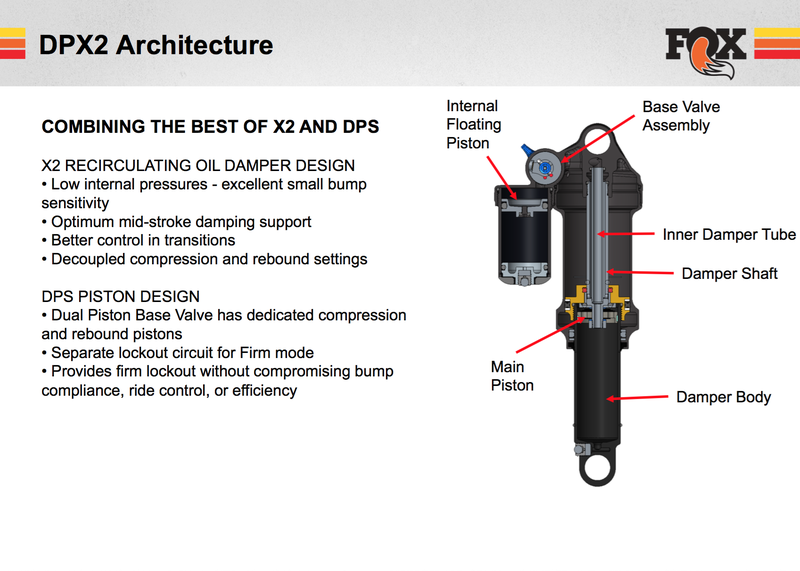 The DPX2 is designed to handle longer, rougher descents than the Float series of shocks, but it’s a bit lighter, smaller, and less downhill-oriented than the Float X2 series of shocks. 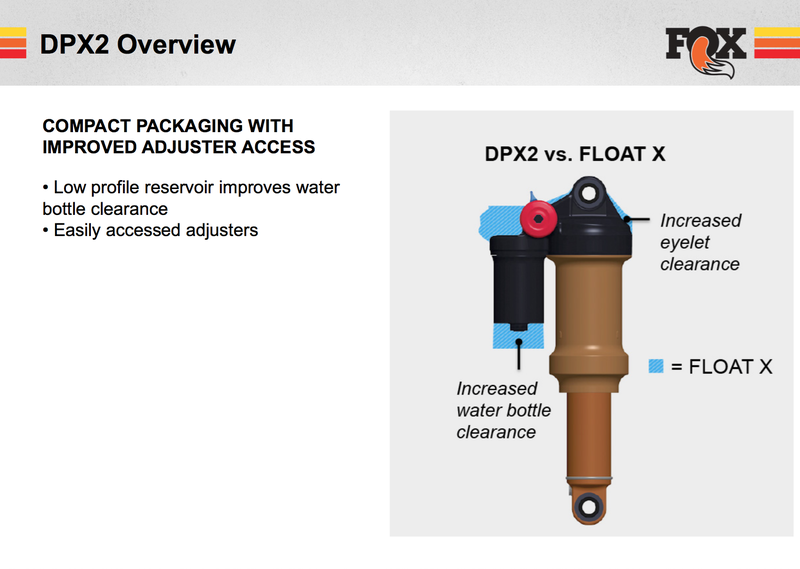 In other words, this is the evolution of the Float X shock, and you’ll likely see the DPX2 showing up on a lot of bikes in the ~150 mm travel ballpark. So what’s new and different? Basically, the DPX2 takes a trimmed-down version of the X2 damper and sticks it into a more trail-bike-friendly package. 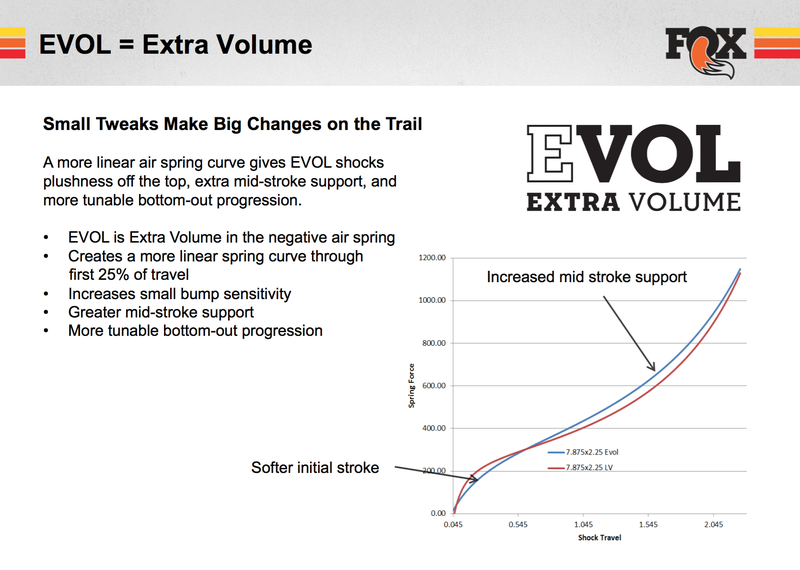 (1) The addition of the EVOL air sleeve, which introduces a more linear progression early in the stroke, and will improve small-bump sensitivity. But at the same time, there is an increase in mid-stroke support, to help the shock remain supportive through the middle of its travel. (2) A reduction in the size of the piggyback, compared to the Float X. This means the shock will fit in more frames, and there’ll be fewer clearance issues with water bottles. (3) More adjustability. The Float X had a three-position switch (Open / Medium / Firm) and three adjustments within the Open mode. The new DPX2 has the same three positions for Open, Medium, and Firm, but it has ten clicks of adjustment in the Open mode. In other words, it essentially has fully adjustable compression settings in the Open mode. It appears that the fine tuning adjustment in Open mode would change both the high-speed and low-speed compression settings. (4) A bunch of fine tuning in the damper to improve performance. That means a separate circuit for the lockout that allows for better small-bump compliance, lower pressures throughout the system to improve small bump sensitivity, improved support in the mid-stroke, and a bunch of other small tweaks that should improve performance and feel. All in all, this seems like an incremental but welcome improvement. We’ve had good luck with Fox’s current crop of shocks, so it’s a fairly safe assumption that the new DPX2 will be a solid performer on any longer-travel trail bike.